I would love for you to follow me on Pinterest and Instagram!! I can't believe it is Thanksgiving time already!! Say what?! I am excited to relax and spend time with family, count my blessings, and eat yummy food! 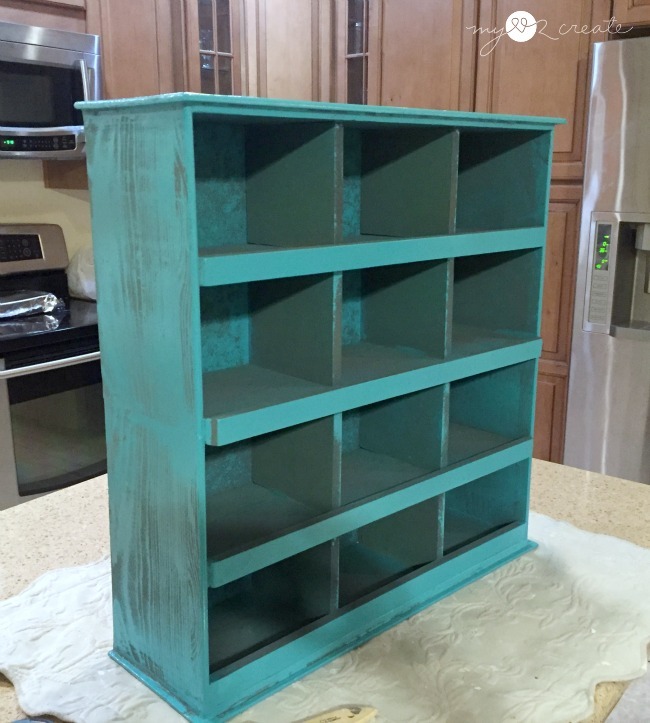 Yep, these drawers were not fulfilling their true purpose in life, but now...they are looking pretty dang awesome! 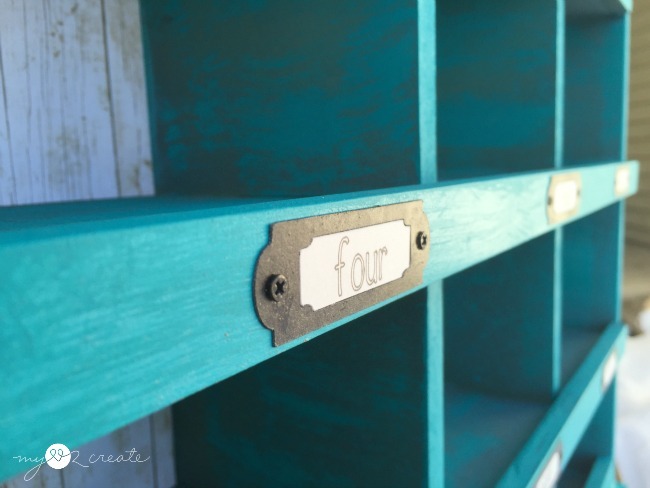 I shared this project as one of my contributor posts over at My Repurposed Life last February, and I am so excited to show you how to build it here! 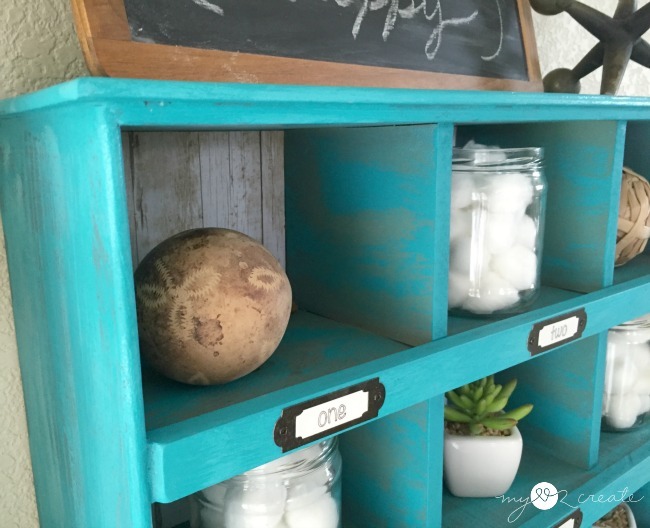 I have always been obsessed with those cute cubby organizers you see in Hobby Lobby, they come in fun colors or rustic wood/metal, with cute labels. You know what I am talking about?! Every time I go there I stop and just stare at them, because I love them so much, I don't know why, but I do. 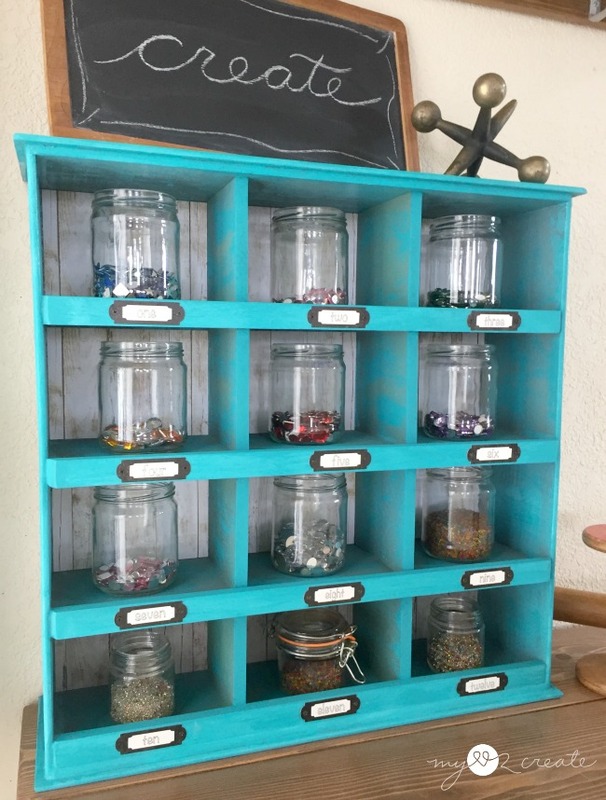 I am happy to report that I finally bit the bullet and made my own...complete with cute labels!! Woot! Wait, I am jumping ahead...lets start at the beginning. These two drawers were the only survivors from a free 4 drawer dresser that finally died at my house. 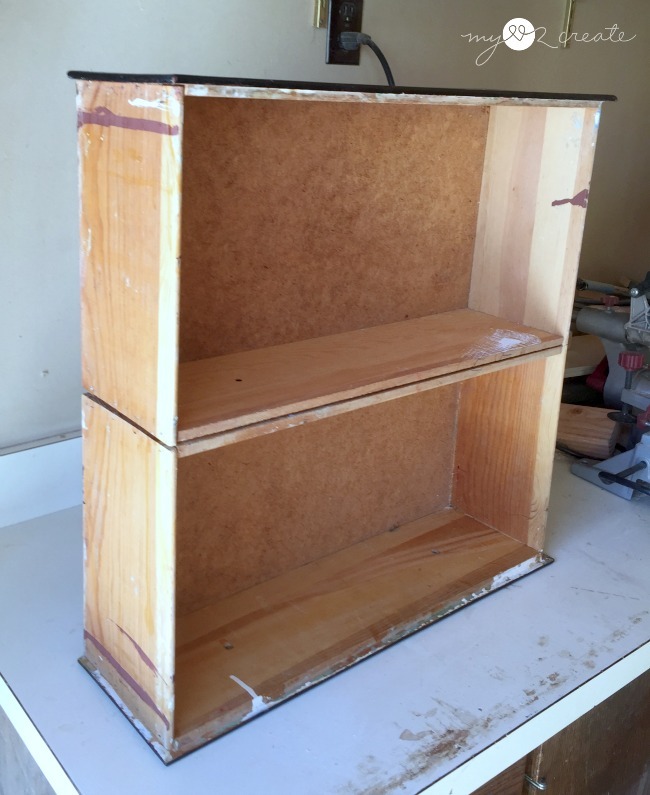 They were in decent shape, I just needed to add some glue and a few nails to make them sturdy. 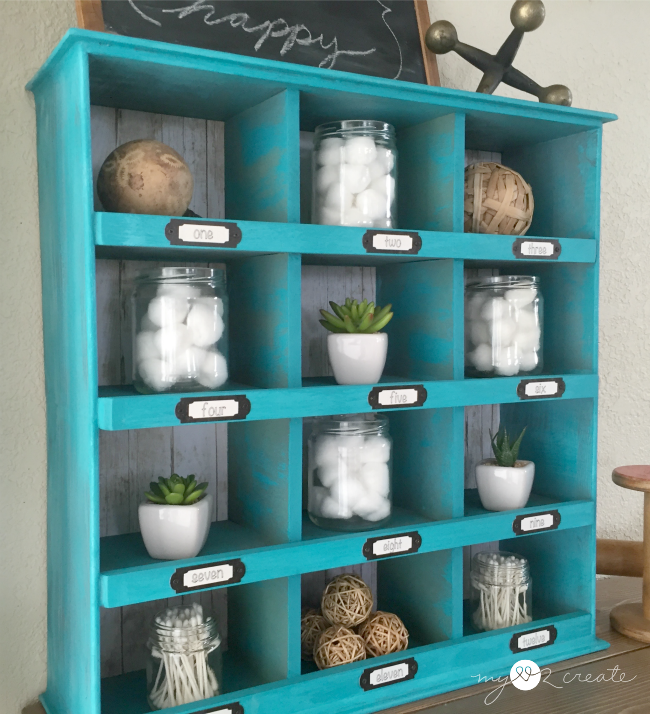 To see if my cubby organizer idea would work I placed them on top of each other...and I knew it was going to be perfect. This post contains Affiliate Links- Learn more! 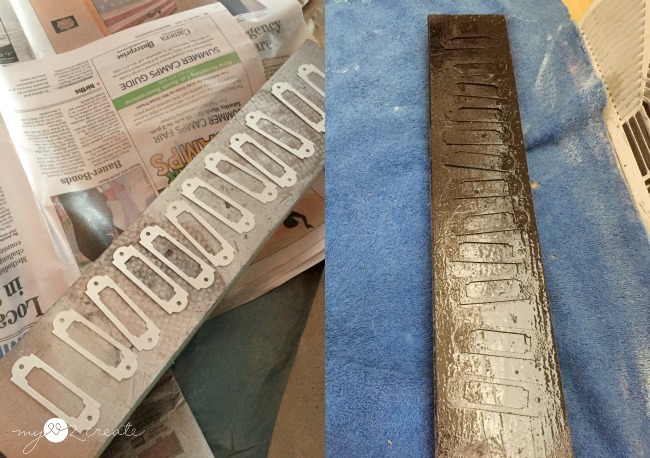 I found a fence board and some mdf from my scrap pile, both were 1/2'' thick and 5 1/2'' wide, which was just the right size, love it when that happens. :) I measured my drawers and figured out that I wanted 6 cubbies in each drawer, which would equal 12 total. 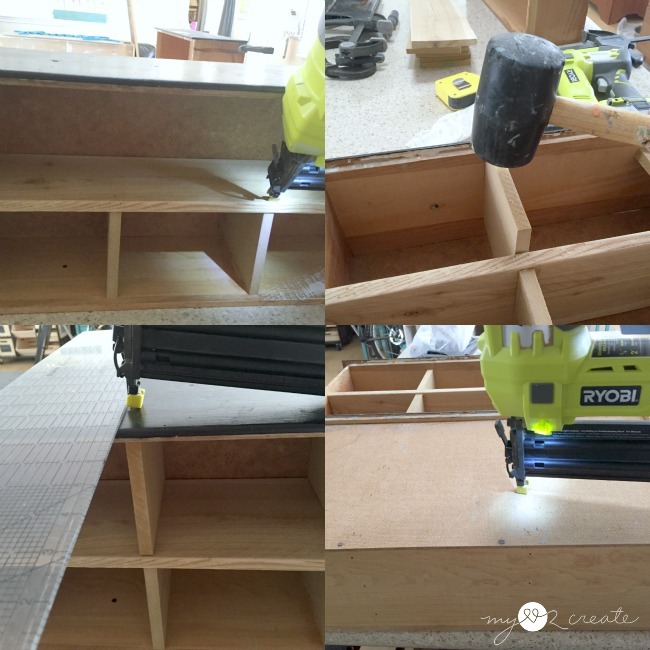 I cut two shelf boards, one for each drawer (from the fence board) and 8 cubby dividers (from the mdf), see the photo on the right. After everything was sanded I quickly escaped the freezing cold to my warm kitchen. :) I started adding the cubbies in the first drawer. 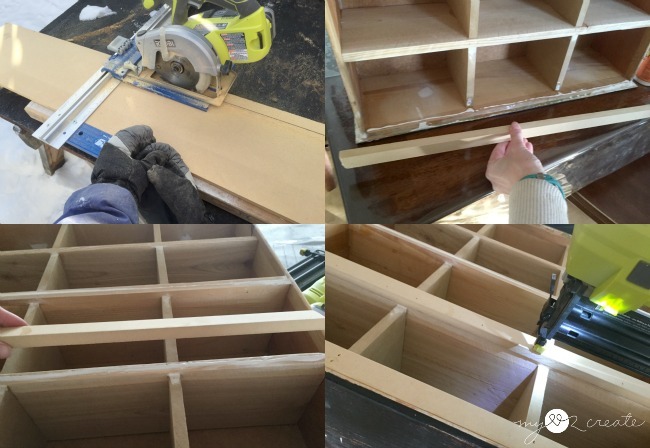 After measuring and marking on the drawer where to place everything I glued and nailed on the bottom dividers and the shelf board with my handy Ryobi Nail Gun . 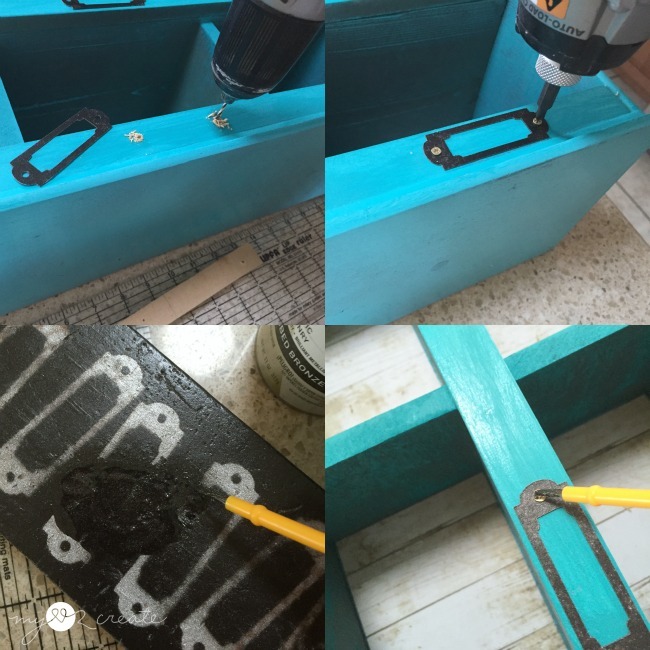 I nailed one nail in from the top into each bottom divider (top left) and then pounded in my top dividers (top right). Next, I nailed them in from the top (bottom left) and used a ruler as a guide. I measured and marked on the back of the drawer where all the dividers were, and nailed them from there as well. Those dividers are not going anywhere! I did this with both drawers. 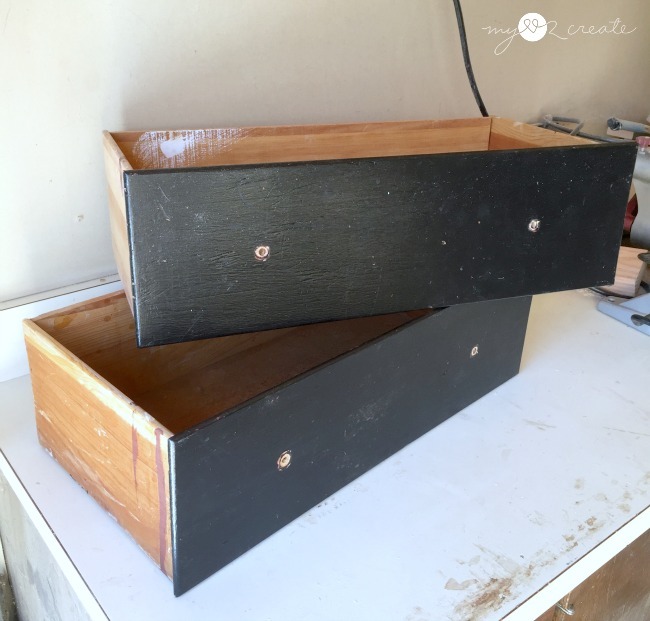 After I had both drawers filled with the dividers, I added glue the the bottom drawer and attached the backs of each drawer together. Then I clamped it up while the glue dried. 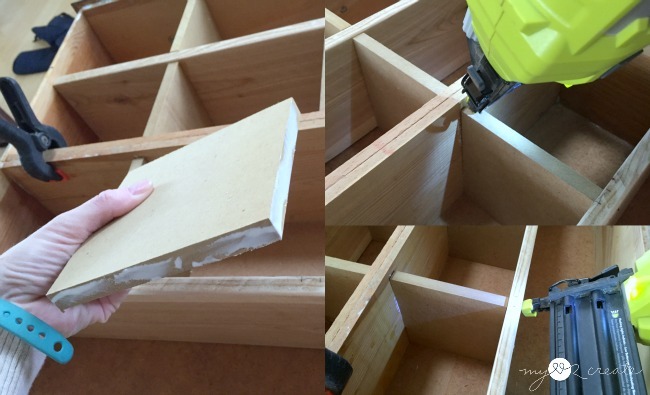 I used my Kreg Rip-Cut and Ryobi Circular Saw to cut strips from mdf, I cut 4 into 1'' strips. 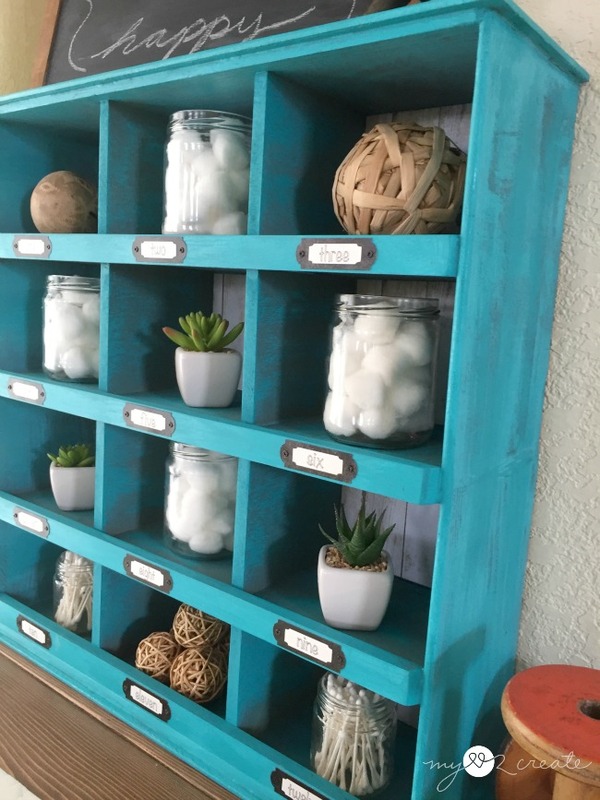 These would be my front "trim" or ledges, and a perfect place for me to place my labels, because I had to have cute labels! 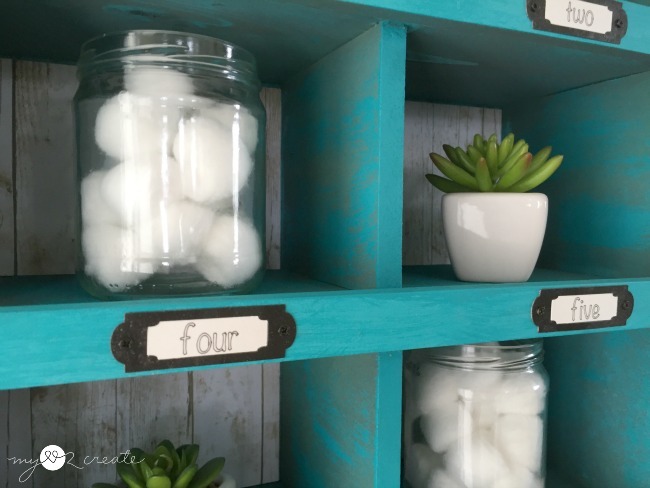 I simply glued and nailed them onto the bottom of each cubby section. My second spray paint attempt had a little more trouble. I tried to re-coat several times and eventually gave up. This is what happens when you spray paint in below freezing conditions, at least that is my theory. 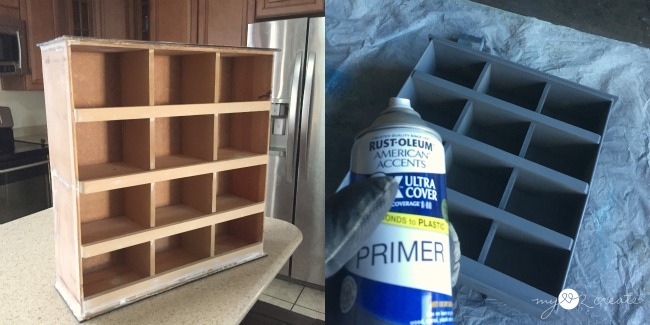 I ended up using a very similar color of craft paint to doctor it up and was pleased with the result. I like it looking a little rustic anyway, which is what I got. 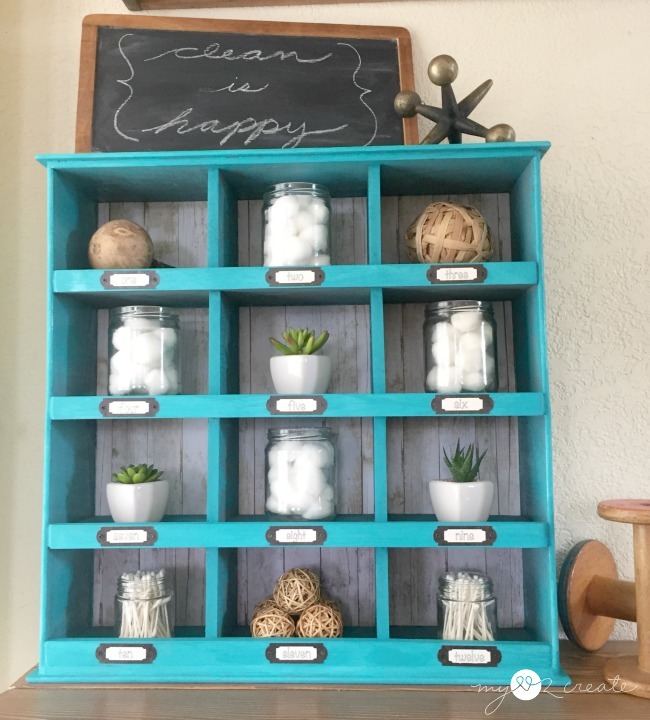 I wasn't pleased with the back, however, and so I found some reclaimed wood craft paper that I liked and used it as a back drop in each cubby, I got it in this Beach House Paper Pack . I had to do some patch jobs with it, but you can't even tell! 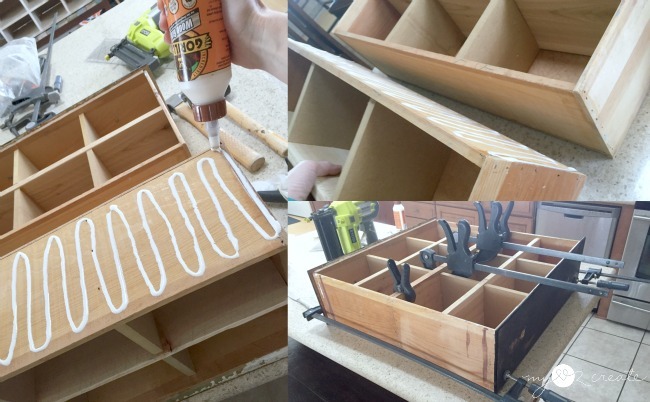 It was easy to cut to size and spray adhesive it so it could stick to the back of each cubby. You can see in this photo I have already doctored up the poor spray paint job. I made a special trip to two different craft stores to by my fun metal labels, and guess what they didn't have enough, I needed 12, AND they were TOO expensive. After wasting a couple of hours driving around and coming up empty, I decided to make my own labels. I have been cutting poster board for another project on my Cricut , and decided that I could cut labels out of it too, since I had lots of extra scrap pieces. I designed the labels and then cut them out with my Cricut Explore . Then I spray painted them with a coat of metallic silver (probably not necessary) and finished them off with Oil rubbed bronze. For the inside, I used the middle section of the original label and had my circuit draw and cut for me, then I just popped them into each label. I would recommend you spray adhesive them so they don't pop out, but mine have stayed pretty well, unless the kids mess with them. I totally got the look I wanted and my labels were free!!! Yippee! 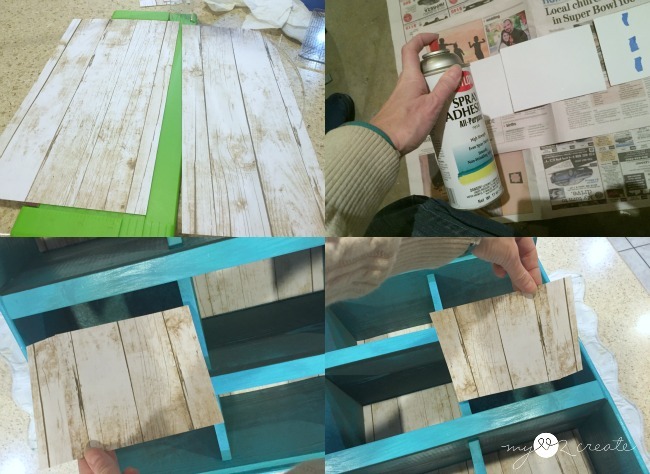 The reclaimed wood paper was perfect for the back, it adds just the right character! I am so glad I had just enough to fit! Or hang it on the bathroom wall! It could hold gaming guys for your kids, or collectible figurines! What would you use it for? Now don't you want to make your own!! DO IT!! And the share a photo with me, cause I would LOVE to see!! What great vision you had! 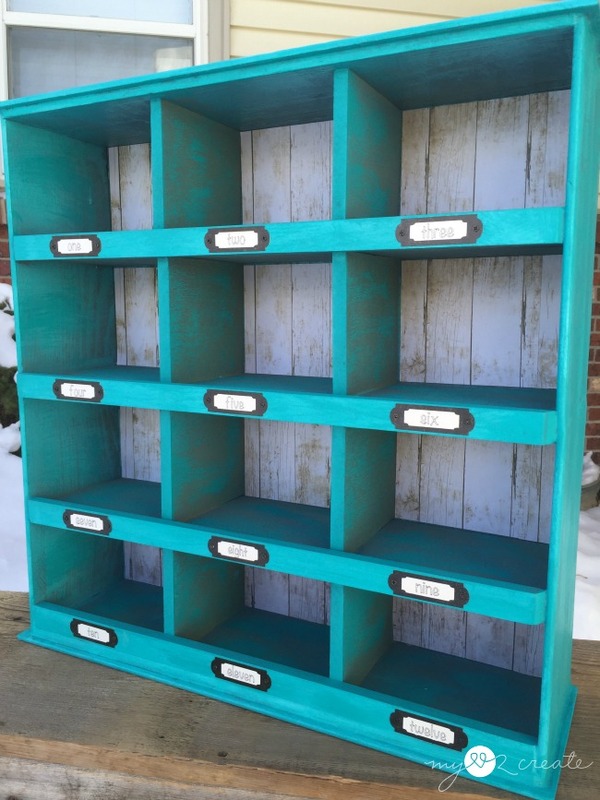 Great upcycled project, love it. Umm... Genius! 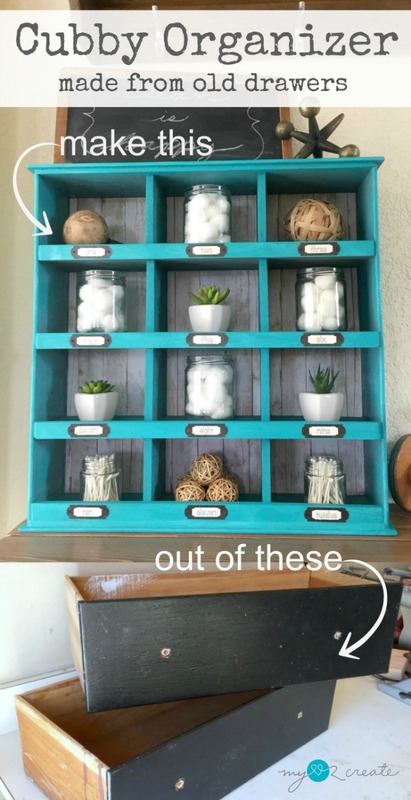 Love, love this idea. Thanks!